Squeeze page/lead gen forms can be A/B tested and optimized to produce greater results. Savvy marketers optimize their forms to find the ideal balance between lead quantity and lead quality. One of the main ways to optimize forms for performance is to add or remove the number of form fields asking for information from prospects, and increasing or decreasing the complexity and sensitivity of that information. For example, a phone number is an especially sensitive piece of information to ask for. Simply put, people don’t want sales calls. In addition, people may choose to put in phony information to that field if they really don’t want to give you the information. While reducing and changing form fields to reduce friction and anxiety is one form of optimization, squeeze pages can also be optimized for conversion by increasing the process- and product-level value proposition on the page. I mentioned that the term “squeeze page” is somewhat of a pejorative and not a neutral term, but the disparaging nature of the term is usually made with tongue planted firmly in cheek. Content marketing — white papers, reports, ebooks, templates, etc. — that reside on the other side of a squeeze page are usually (and should be) of high value to the prospect; however, the company does not charge any money for that valuable information. The company essentially expects customers to pay with their own information (email address, company size, etc.) for that information. Information is the currency of the internet. Even beyond marketing, many services that customers perceive as “free” (i.e., charging no monetary cost), in reality, are paid for with users’ information in one way or another (e.g., Google, Facebook, etc.). For this reason, squeeze pages should be used in a way that fosters at least an equal value exchange. It’s even better if prospects view the information they receive in exchange for filling out the form as more valuable than the information they had to give. In addition to ensuring a strong value exchange, squeeze forms can collect information as a reason to deliver that value. Our philosophy at MarketingSherpa, in our own use of squeeze pages, is to create a value exchange weighted toward the customer. 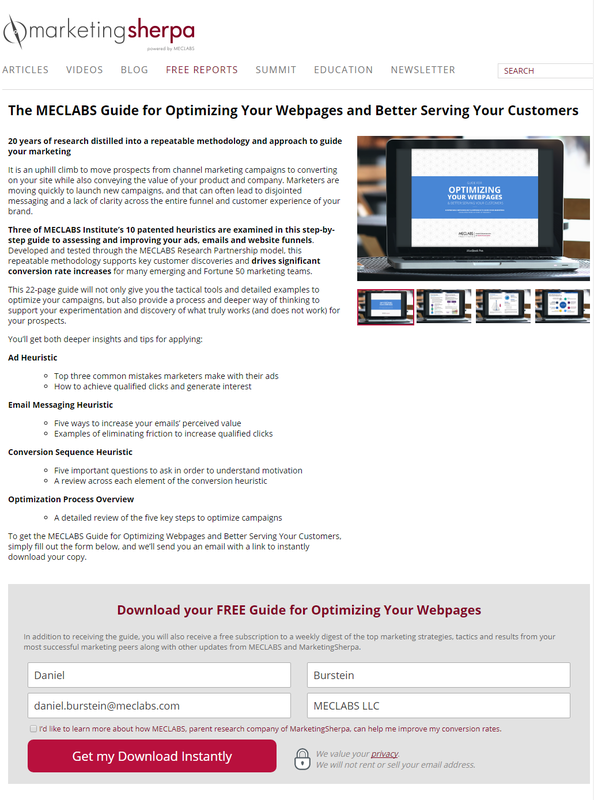 For example, our parent research organization, MECLABS Institute, recently launched The MECLABS Guide for Optimizing Your Webpages and Better Serving Your Customers. This is derived from the Institute’s highly valuable content — a patented methodology to help businesses improve conversion. An image of the page is below, or you can click the previous link to experience the page for yourself. As you can see, we provide significant product- and process-level value proposition information before asking for information from the audience. We give before we get. In addition, we don’t ask for much information. And if you’re already a MarketingSherpa newsletter subscriber, the information will pre-fill into the form for you to make it that much easier (which is why you see my info in the form). Perhaps more important than the squeeze page itself is what you do with your prospects’ information once you receive it. Based on which of your squeeze pages they fill out (and it helps to have several hitting on the key pain points and goals your products and services help with), you can better target information to their needs. Or, you can use it to badger them with sales calls. Prospects will react better to the first approach than the second, and also view your squeeze pages in a better light going forward if they know that what comes after the squeeze page continues to add value. Many marketing automation platforms and email service providers allow you to send triggered messages; then they begin drip campaigns based on the form fill on that squeeze page. This is another opportunity to add value through lead nurturing after the form is complete. You can also use a technique called progressive profiling, paired with a series of squeeze pages on different topics, to get more information about prospects to better serve them with your content and marketing. For example, the first form they will out might ask for name, email address and company. But then two weeks later when they get to a different squeeze page from your company, you ask about their company size, location or address since you already have the name, email address and company- name information in your database. Of course, squeeze pages are not the only way to use content marketing to generate and nurture leads for a complex sale. You can choose to have your content ungated and freely available for download, reading or viewing by anyone who comes across it, but also include messaging and calls-to-action that encourage prospects to contact your company about its products or services. On the flip side, these “hand raisers” are likely higher-quality, more qualified leads providing more accurate information, since they are essentially asking your company to contact them about products and services. Most companies use a combination of these two techniques — squeeze pages and ungated content. After all, even a blog post should be valuable content, and it is extremely rare to find a company using a gated blog post. Is it up to lead generation marketers to discover where is the best place to put up squeeze pages for their company and their unique prospects — on a spectrum ranging from everything ungated to everything gated behind a squeeze page. How Brand Marketers Hitched a Ride on The Solar Eclipse in Social Media Marketing Been There, Done That: Are marketers neglecting the mobile app experience?